Walk us through a typical Day in the life of Ali Tamposi. Ali Tamposi: I wake up, I eat cereal to fuel the brain, then I try and go on a hike to Fryman Canyon. Sometimes I make it there in the car and turn around and go back and sometimes I make it up the hill [laughs]. Then I usually head straight to a session or a meeting. The sessions vary; it could be a writing session or an artist session, or writing camp, or meeting with different industry people. Nine times out of ten, at the end of the day, I will go meet Livvi Franc for sushi and we talk about our sessions. Then I go to Pinkberry and go home, have a glass of red wine for a nightcap and go to sleep. When and where did you and your co-writers write “Stronger?” How long did it take to come together? And I go into the studio, and David Gamson comes out with some coconuts and some straws [laughs] like, he’s all free and happy go lucky. David sits down and starts playing some chords, Jorgen looks at me and says, ‘What’s your concept?’ We go through a bunch- no, no, no—then I say, “What doesn’t kill you makes you stronger?” and Jorgen’s all, “THAT’S IT.” We wrote the song, I left the session Jorgen cut the demo, and I didn’t think anything more of it at the time. My head was in another place, the song is alright, nobody really says anything after the session, fine. Two or three months later I get this email saying, “what doesn’t kill you” is a freaking smash! I couldn’t believe it. I have been sending out songs that I feel are smashes the last five months and nobody said anything and you think that song is a smash? But then I heard it—Jorgen had a demo singer come in and recut it and it sounded incredible. At that point, my manager Tom Maffei sent the song to Jeff Aldrich., who was Kelly Clarkson’s A&R at the time He flipped over it but said it needed edgier production. So Tom had Matty Trump, one of his other producers, reproduce the demo– which landed the placement. As time went on they decided that they wanted Greg Kurstin to produce; Kelly loved the song, but it wasn’t until the Superbowl last year that Kelly actually cut the record. I went in and helped with cutting her vocals with Greg and he was so great to work with. And Kelly absolutely killed the vocal. And now here we are, wow. How much did you edit the song — were there any words or phrases that you remember were especially tough to make a decision on? Are there any alternate lines to that song? Yes. The first lyric was originally “you know the bed feels warmer sleeping here alone/And my days are brighter not staring at the phone.” Kelly came in and wanted to change a few lyrics and stuff so that was the one particular line that she wrote : “you know I dream in color/and do the things I want.” Which I think is a better line, but we were going back and forth with the label, and the label wasn’t sure so they had me write another line. And I said, Friday nights are better than dancing on my own or whatever it is. Then Kelly cut both lines, and they finally decided that the ‘dreaming in color’ was a better line. So that was one particular thing. But the one line that I think is among the better moments in the song, and means the most to me personally is, “doesn’t mean I’m lonely when I’m alone.” That was a line I really connected with when I wrote it. Tell us about “Stronger’s” path from its completion, to Kelly hearing it, to its inclusion on her album, to the decision to make it a single. It was baby steps. We had no idea where the song was going to go or it if it was even going to get to Kelly. Finally, her management approved the demo, then Jeff Aldrich approved it and they sent it to Kelly who immediately loved it. So from September when it was written it wasn’t until about January 2011 that we got word back Kelly loved the song. As far as when we knew it would become a single, we didn’t! Until after “Mr. Know It All” was already on the radio. How has this experience of getting a major label cut affected you? Were you given the opportunity to hang around the studio while Kelly recorded the song? 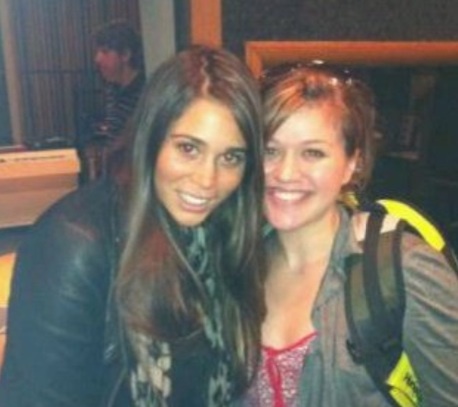 Greg Kurstin did invite me to go by and meet Kelly in the studio on Superbowl day—last year. It’s weird to think about that, almost exactly a year later. Anyway, when I walked in she was in the booth and asked Greg, “who’s that?” and Greg said, “Oh that’s Ali.” And Kelly runs out and gives me such a big hug. I was like, “Is this really happening right now! !” She was amazing, asking me about harmonies and melodies on certain things, it was incredible to work with her, such a fun experience. Step outside the song for a moment. How would you describe “Stronger” as a music fan? I would describe it as an empowering song. It’s the jam on the radio you can dance to, cry to and sing at the top of your lungs to. I feel that there are way too many “victimized” songs out there and this is a feel-good record. Did the finished version meet your vision of the song? Oh it went beyond it. It completely beat my expectations. Greg sped it up 5 bpm’s and gave it good energy, gave it life, made it a top forty record. What do you enjoy most about the process of writing songs? I enjoy the therapy in it. I enjoy going through a personal situation in my life and being able to express it in a song. And without, I would probably be a complete basket case. I have the best job in the world. I can’t not write songs, I’m in the car listening to music on the radio and I’m thinking what I would write and singing melodies on top of their melodies, it just comes natural. I love the creative part of it. I love the moment when you play back a song and the energy between the producers and the writers and all of us are in there and we’re excited about what we hear. And even if nothing happens from that particular session, at least we all knew that we enjoyed the process. What are your long-term and short term goals as an artist and writer? My long term goal is to have a writers/producers compound in Venice on the beach. One big studio and a few production rooms. My whole team would be working there and I’d never have to go to another studio again.We’d cruise around on beach cruisers for inspiration and we’d surf on our lunch breaks. For the short term, I’m doing fun little projects. Milk N’ Cookie is my ‘artist’ thing with Livvi Franc, that’s gonna start taking off soon. We’re doing like a, tripped-out alter-ego group and working hard on that. And just continuing to write as much as I can without getting burnt out. I’ve found my group of producers that I love and I want to keep working with them, writing new records, building relationships, and pushing forward. I just…can’t believe I get paid to do this. I would be doing this if I had a 9 to 5 job in a bank as the receptionist giving out lollipops. I would leave the bank and go have writing sessions with people just for fun, just for the love of it. Any words of wisdom for aspiring songwriters about the craft and the business? Yeah. Just when you think things are not happening and you feel yourself turning back and throwing in the towel—I’m telling you—it can take just one day to the next that things completely do a 360. And I am saying this because it happened to me. I was living on my stepmom’s cousin’s couch in Brentwood. No friends, no record deal, no nothing. I moved out here to LA not knowing anybody, and pushed and pushed, and did whatever I had to do to figure it out. And I was a new writer, and unfamiliar with the process, but just learned, studied, kept on pushing myself thinking of concepts, new ways of doing things, and never stop. The only way its not gonna happen is if you give up on yourself. And with the process, you’re going to have days where you have writers block and feel uninspired . There are definitely sessions where I leave and think, ‘how the hell am I a writer, I can’t think of anything, completely blew it, I screwed up! ’ and then there’s sessions where you’re on cloud nine and and you leave the session knowing exactly why you are where you are. You’ve gotta just keep pushing through. And always think of new interesting ways of saying things. How many different ways can you tell someone you love them, you miss them, you hate them, In quirky, fun ways that people get. Be creative. I find my inspiration comes from old music and from movies. Or sometimes the inspiration comes from a tagline someone says. You just never know. The music business is very cutthroat and dog eat dog, but you find the people that you trust and you love and just know that if you’re doing the right thing and you are loyal to people and continue to build good relationships, you’ll be fine. But keep your head down, don’t look at what is gonna happen or what’s supposed to be happening, or what you wish will happen, look down and watch your feet move one foot in front of the other. That is the only way you are going to get there!